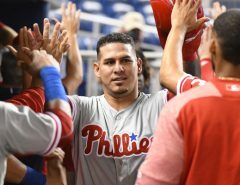 Coming into 2018, the All-Star right fielder was poised to lead the Nationals to the playoffs once again; poised to lead the fireworks at the Home Run Derby; poised to sign one of the largest contracts in the history of the sport. One of three ain’t bad, I guess. But it also ain’t good. The Nationals currently sit under .500 more than 100 games into the season, seven games back in a division race that wasn’t supposed to be close. Thus far, the Nats have proven themselves to be a buyer at the non-waiver trade deadline, just five days from now. 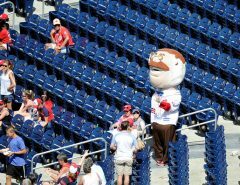 But as the losses continue to rack up, questions we Nats fans never thought we’d have to consider are being asked: Should we Sell? Should we sell Harper? That question was asked and answered in a piece on The Ringer, in which the author laid out the case for moving on from Harper at the deadline. As an objective observer of baseball in general and the Nats in particular, I agreed with neither his opinion or his arguments. 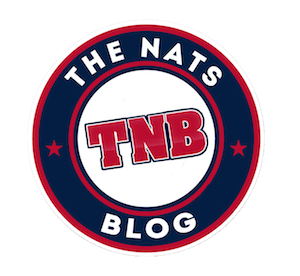 As an unapologetic Nats fan, I thought the piece was a shoddy piece of click-bait written by somebody who couldn’t tell you what a Nats Dog tastes like. 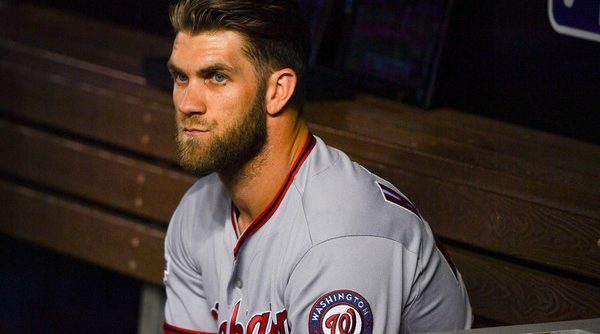 It’s admittedly difficult to know this if you don’t go to the games, but it turns out that Bryce Harper is a person, and a very important person to Washington Nationals baseball, at that. He’s not simply an expiring contract with a wRC+ of 120. He has personality. He has pride. He cares deeply about baseball, seemingly likes playing with the Nationals, and has legitimized this team and this sport in this town. In national circles, it’s been an almost foregone conclusion that he’s destined to sign with some non-Nats team in the off-season, but I’m not so sure. I think the smart money is on the Nats. Unless, you know, we trade him, though The Ringer doesn’t think that will be a problem. 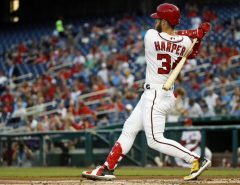 He tells us: The greatest unknown variable in this exercise is how trading Harper, who is a free agent after this season, might influence Washington’s contract negotiations with him this winter. Sending him to another team won’t necessarily ruin those talks before they even begin, though. As proof, he offers 2016 Aroldis Chapman and 2014 Jon Lester. Chapman was traded from the Yankees to the Cubs at the deadline amid controversy stemming from his arrest for domestic violence, won a ring, realized the market for long-term deals for closers (especially controversial ones) was small, and re-signed in NY. Lester was traded from the Red Sox to the Athletics and then signed with the Cubs the following offseason. But don’t fret, the author says, Lester almost signed with the Sox. I, for one, can’t wait until Bryce almost signs with us. That way we’ll know that trading him away will have been worth it. But he keeps going. He implies that trading Bryce would net a major league-ready player enticing enough to encourage him to re-sign in the offseason. But that’s not likely or even realistic. This isn’t basketball. One player, even a Top 50 prospect, isn’t going to move the needle for Bryce that much. Or make the Nats 2019 playoff hopes any brighter. Remember, Bryce is a three-month rental. Look what the Orioles, who have similarly little leverage, got for Machado. Unlike the Orioles, though, the players on the Nats are already good! You’d already want to play with Max or Trea or Tony Two Bags. The Nats are an enticing team. Trading Bryce allows him to see what life outside the Nats looks like, test the waters. You let Mike Bordick do that. Not Harper. And yes, the Nats could see him walk and receive nothing but a compensatory draft pick for their troubles, but every team with free agent players runs that risk. Expiring contracts are often trade-targets, yes, but again, there are shades of grey here. The Nats are built to contend this year, and Harper has the highest Q-Score in the sport. He sells tickets, he sells jerseys, he helps local kids fall in love with the game. That doesn’t get baked into his wRC+. If you’re the Nationals and he walks, he walks. You tried. If you trade him, you’ve become the villain that’s marquee player starts every fifth day. What gets lost in all this — or in the case of The Ringer article examined from the opposite point of view — is Harper’s potential to right the ship. The author argues that’s why Houston should trade for him. His peripheral numbers line up with his performance in the previous season because that’s the case, we can expect the God of Positive Regression to allow a few more of Harper’s batted balls fall in for hits. For the Astros, the author argues, Harper is a buy low. Flip that around, though. If he’s a candidate for positive regression, your team has underperformed but built to contend, wouldn’t you want to keep Harper? The same reason you’d want to trade for him is the same reason you’d want him to stay awhile, right? So let him catch fire in a Nats jersey, run down the division or a wild card spot in a crowded National League race, and let postseason wackiness do its thing. For as much panic as there’s been, and deservedly so, there’s still two full months left to play — and 21 games against the Marlins and Mets. Yes, the Nats have underperformed. Yes, Harper has struggled. Yes, it feels like the world is caving in. That’s all true. But we have to take a long-term view: Trading Harper makes the Nationals worse today on the baseball field and the organization less relevant. He’s 25 and is already an all-time Nat (albeit a low bar to hurdle). Team’s blow up their rosters to get a player like him. He’s a key cog on a big market contender, young enough that his best years are likely still ahead of him. Do you think if the Yankees were in the same position they would trade Aaron Judge? Or the Red Sox and Mookie Betts? The Cubs and Bryant? Heck, the Reds haven’t been good in years and haven’t traded Joey Votto. The Nationals should absolutely not trade Bryce Harper. This can still be his year.